Ecodor is the market leader in odour control and removal of unwanted substances. Through a very fine spray of biological odour control products, Ecodor eliminates the odour quickly and effectively through a natural and responsible manner. Our odour control and removal technology is capable of controlling the odour problem through the use of environmentally friendly chemicals and NOT masking products. Eliminating the smell of cat urine has never been easier! Some years ago, Ecodor launched a number of new products to assist pet owners with the removal of stains and the neutralizing of cat urine odours within the home enviroment. Finally, the result is an environmentally safe product that eliminates the odour of cat urine. It works so well that in a short period of time there are now a few million users on the western continent of Europe which continues to grow on a day to day basis. With pets, it seems that Murphy's Laws still apply: excrements or vomit usually land on your carpets, sofas or curtain and now, with the help of Ecodor, you have the solution to complete odour and stain elimination within your home. Your pet will no longer be attracted to 'that spot' of the carpet! UF2000 is a powerful urine odour neutraliser which effectively combats the unpleasant odour of cat wee. EcoHome is ideal for neutralising unpleasant smells in and around the home. e.g. kitchen, toilets, nurseries, refuse containers. It will remove cooking and tobacco or tabacco smoke smells. You smell the urine, but cannot find the spot? With the help of the Ecodor Spot Urine Detector you are able to find the urine spot that was invisible from the naked eye. 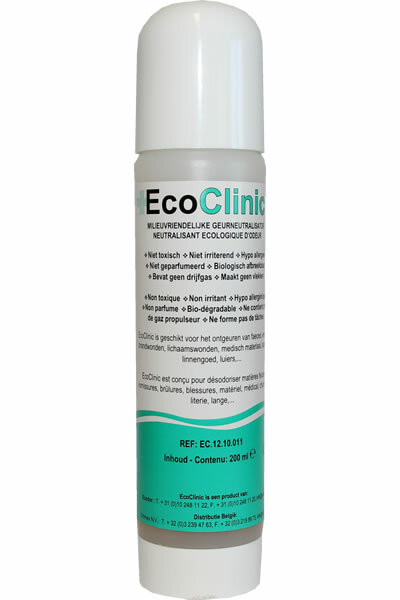 EcoClinic is an environmentally friendly smell eliminator based on natural enzymes. This air freshener makes smells disappear, when they physically come into contact with the complex protein systems in the freshener, where they are then catalysed into non smelling, harmless and simpler molecules. 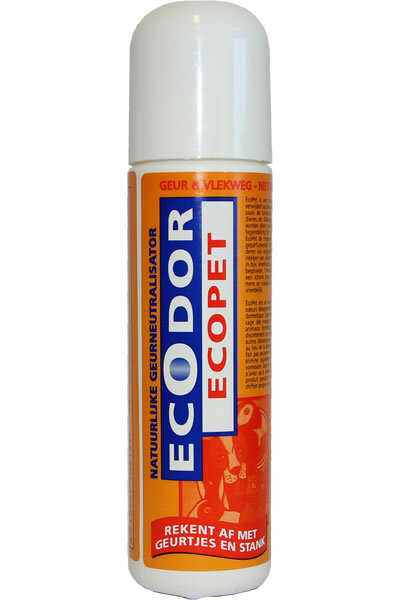 This Ecodor product allows you to clean your pet’s coat without water and can be used on dogs, cats and rodents. WonderClean coat cleaner is based on harmless vegetable protein which removes unpleasant odours and dirt from your pet`s coat. 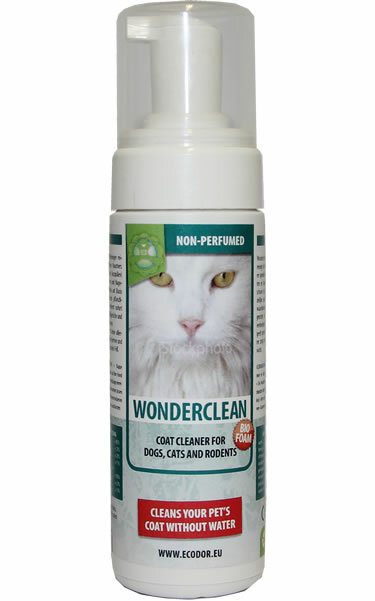 WonderClean coat cleaner is non-irritating, hypo-allergenic and leaves your pet's coat clean and shiny. EcoFeet is a spray that removes unpleasant sweat odours. EcoFeet breaks down the sweat molecules in a natural way, making the smell disappear instead of masking it. EcoFeet is ideal to the use in shoes or even to apply directly on the feet and it can also be used for clothes and other parts of the body. EcoPet Odour & Stain Remover is a bio-spray which removes unpleasant smells & spots from places where your pets visit frequently, such as the cat box, dog basket, rodent cages, etc. In contrast to the ordinary air refreshing products, EcoPet removes the undesirable smell instead of masking it with an air scent. Already an owner of Ecodor product and tried it out? We welcome any comments that you may have regarding the effectiveness of our product range. Write a review or comments concerning our products and receive a discount code which entitles you to an amazing 15% discount on your next order via our web shop. Click HERE to view current comments and reviews from existing users.